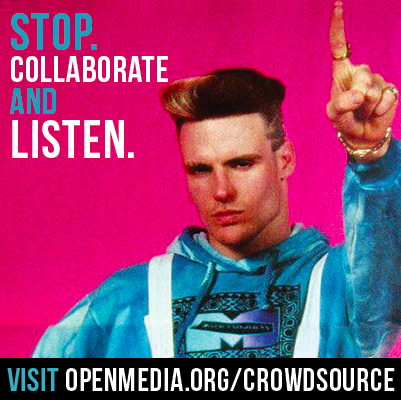 Meet citizens where they are at – that’s the rule we follow at OpenMedia. Beyond the town hall, during our two-year process, we also provided citizens with a variety of options to engage with the project using social media and blogs, including: viral-ready share images, infographics, videos, embeddable online tools, and blog posts updating citizens on the progress of the project to define a digital future that works for all of us. Our multimedia and interactive outreach efforts helped increase engagement with our crowdsourcing process. For example, our share image asking citizens to donate to buy an ad in the Washington Post aimed at U.S. Trade Representative Michael Froman reached an audience of 20,000 people. 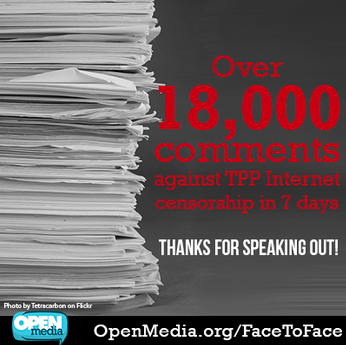 Our TPP infographic generated over 1,000 shares and likes on Facebook. We also helped organize two Reddit question-and-answer sessions to increase online participation in our TPP campaigns and outreach efforts.43 44 Over 4,000 people joined our two Reddit crowdsource appeals regarding the threats and dangers the TPP poses to Internet freedom. Both events were highly engaging, and participants provided us with key insights on the everyday implications of copyright censorship proposals. Throughout the process of engaging citizens online through social media, OpenMedia helped to activate thousands of people who gave feedback and asked questions that helped us identify emerging themes and core concerns about copyright, eventually feeding into the recommendations we have laid out in this report.